Dainese has finally released a true track worthy race boot for women. Full lateral ankle support and more. The Torque D1 Boots are the real deal. Although I have loved my Sidis very much, even after crashing in them two years ago, I decided to buy these Torque D1 boots which were released last Spring. They offer more ankle support which I appreciate. With the two track days I did this year and the additional track days I plan to do next year along with the aggressive style of riding that I enjoy, I felt these were a logical upgrade to provide myself maximum protection.The Torques are also the *only* race level track boots for women on the market. Full ankle support and all the same protection as the mens version with the same name. Side view of my right boot. I'm also going to start doing more track days next year so having a boot as protective as these is crucial because I don't want to take any chances. As you may be aware, Dainese makes fantastic track wear. Their specialty and niche is sport/race and track. 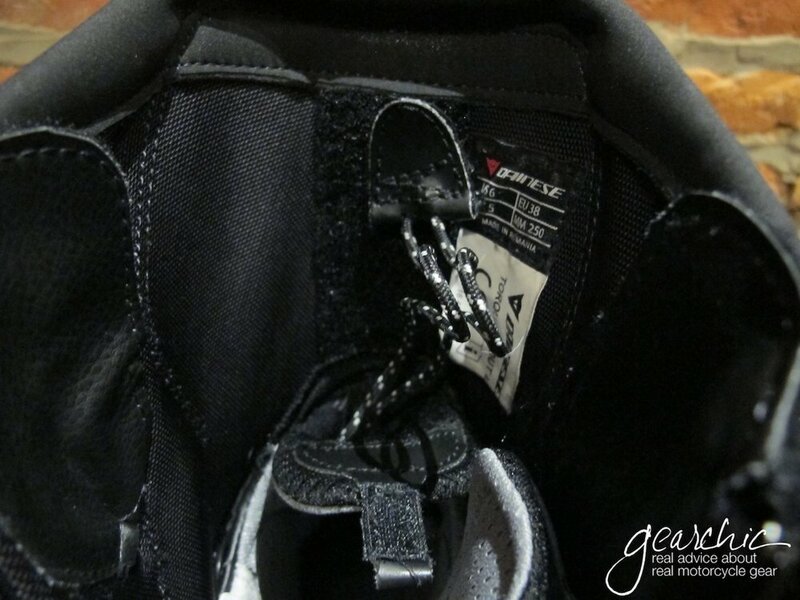 These boots are #2 in their lineup below the Axial Pro Ins which only work with Dainese Suits due to the Velcro. For women like myself who want and need more ankle protection, options are few in the sport world. There are 3 brands who make sport boots with proper ankle protection (Sidi, Alpinestars and Dainese). 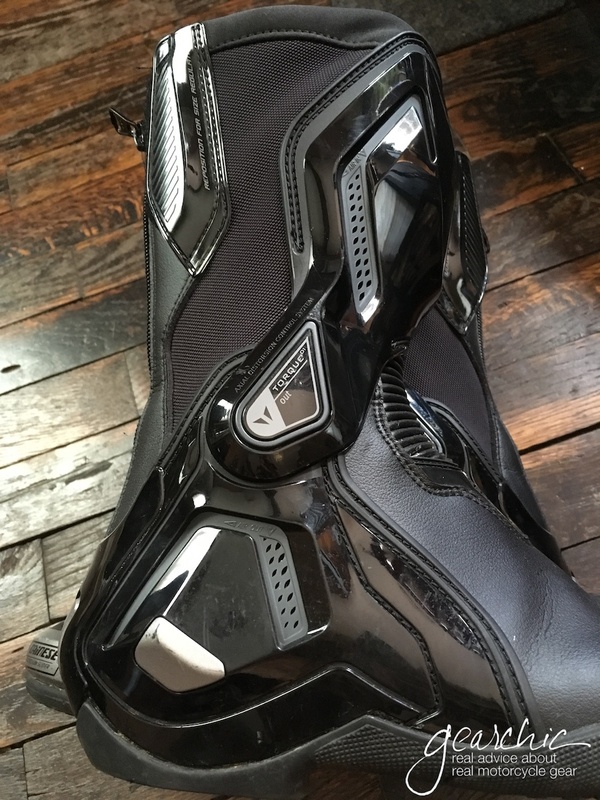 Dainese and Sidi actually offer 2 different boots for women too. But the Torques are special due to the unique external ankle bracing that runs alongside both the right and left side of the leg. This provides ankle support to limit side to side movement. so you can't twist your ankle or bend it sideways (ouch). The most comfortable aspect of this boot (but they are!) is the stretch panel right across the ankles. This is crucial when you're on an aggressive bike especially on the track and your knees are bent. On a sporty bike, you need your gear to work for you, so that everything fits the right way and is comfortable for these kinds of riding positions. It simply makes bending your knees a lot more comfortable and increases your range of motion. See the honeycomb panel below the stretchy panel? That's where you'd feel ventilation if you buy the Men's Air Versions. If you're wondering about warmth, I wore mine in 49F (before windchill) in October and they were fine! I only wore a light sock as well. I think I could push these to low 40s before whipping out the big guns. If you have larger feet, then you can fit the GoreTex Versions. Gotta bend the knee (I know right, why didn't he?) to get that zipper up. And by the way, if you are lucky enough to need a women's 7.5-8ish (unless you're a super narrow women's 8-8.5) then you can order the men's versions which start at Euro 39! And if you like the other colors, then I would order that instead. I kind of like the Hi Viz combo myself. You also have access to the Air versions if you fit a 39. Although these are not the air versions, they breathe pretty well and my feet are comfortable all day as far as warm temperatures go. You also have to know that I've been wearing sport boots 100% of the time I ride for the last ~5 years. I am used to wearing boots like these and always plan ahead to have casual shoes with me if I need or want them. 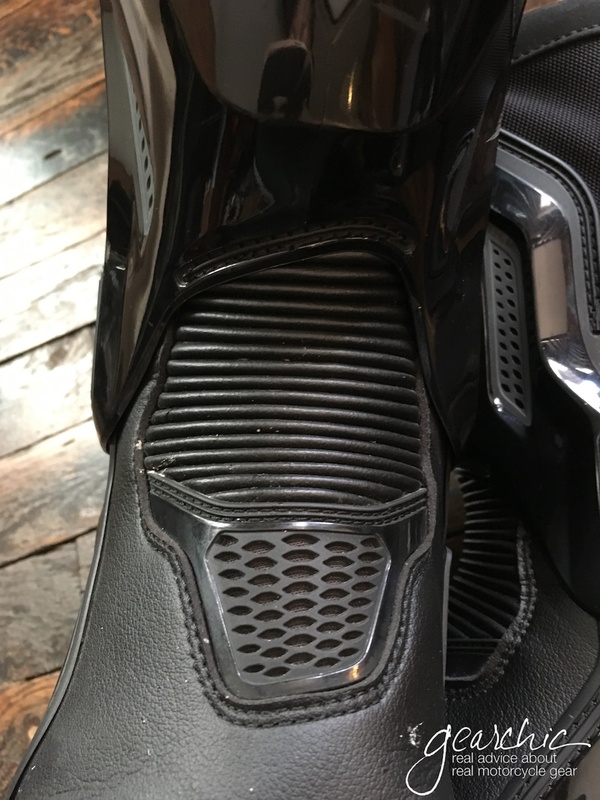 IF this is your first jump into motorcycle footwear it might be a difficult path to follow as far as wearing them for longer periods of time. So make sure you wear them at home, around the house for a few times before you consider riding in them. I am a bit worried about wear and tear as far as the soles but not enough to sway me from buying these. 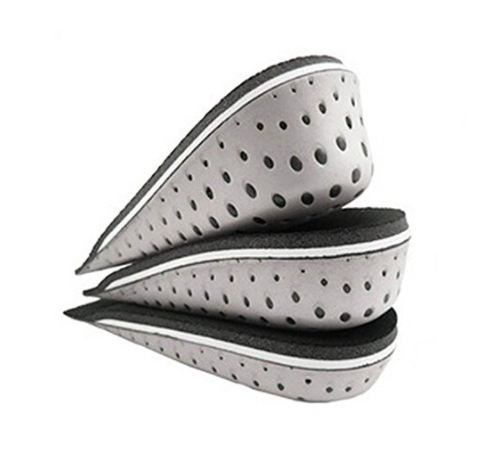 The soles are certainly designed to provide plenty of traction and grip, so the material is also very firm. I know that eventually I'll have to replace them completely when the soles start to wear out but I don't anticipate that happening for awhile. For me, the compromise is worth it for the protection they offer. If I wear them out sooner I'm happy and fortunate enough to buy another pair. I tried them on when they launched last season but I was disappointed at how narrow they were. I decided to try them anyway, and simply chose to size up instead. I normally wear a Euro 36 (if it's wide enough) or Euro 37 or 6.5 US for the most part. I have small, short, wide and square feet so wearing a slender, narrow boot like Dainese can be hard for me. So Euro 38 was my choice. 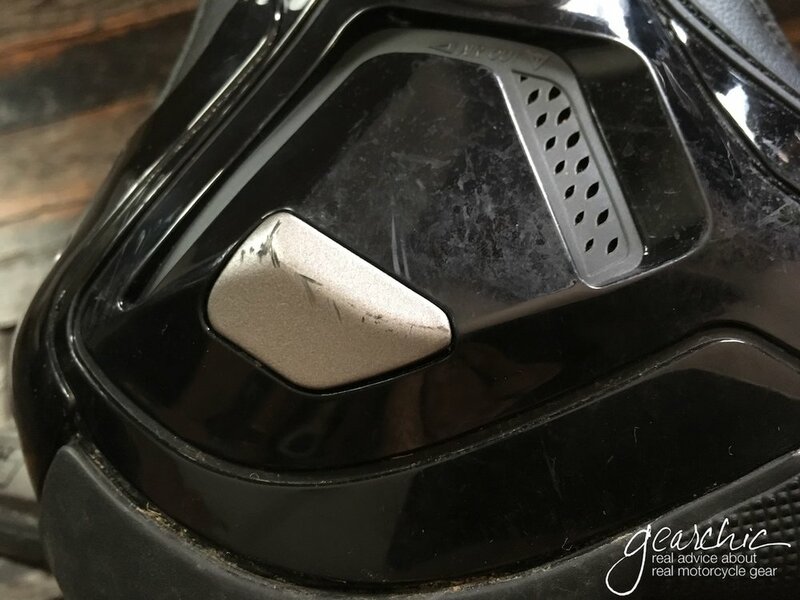 As you may know I also like wearing inserts like these in my riding boots so I get one flat left (because come on, we'll never get two flat feet on a mid size sportbike!). I have the Kalevel insoles below but am experimenting with my SuperFeet Green and one of the Silicon heel inserts to see if I can get a little more walking comfort. I've added links to a couple of other soles you can find on Amazon as well. So after spending a good 2-3 days wearing them at home before I rode in them, they are perfectly comfortable and a little on the loose side because I sized up to a Euro 38 to accommodate the insoles properly. The entry is rather narrow as you can see. I couldn't even get my foot into the 36. Getting them in 37 was fine without my fancy insoles so I knew I had to bump up my size. You may also be wondering about the calf space. There is enough room for larger leathers or track pants (assuming the pants aren't too long or too loose). With the velcro panels alongside the rear zipper, you can expand them enough to fit your leathers. In case you're wondering I have 15" calves and these still have some room to spare even with my 1 piece suit and with my leather pants. You'll have to unvelcro them first and then zip up if you need the extra calf space. Since I've broken these in, they've definitely stretched out and now even with my inserts I still have a bit of extra space. I've probably logged a good 3,000 miles in them and I can say that I really like the way they fit and feel. 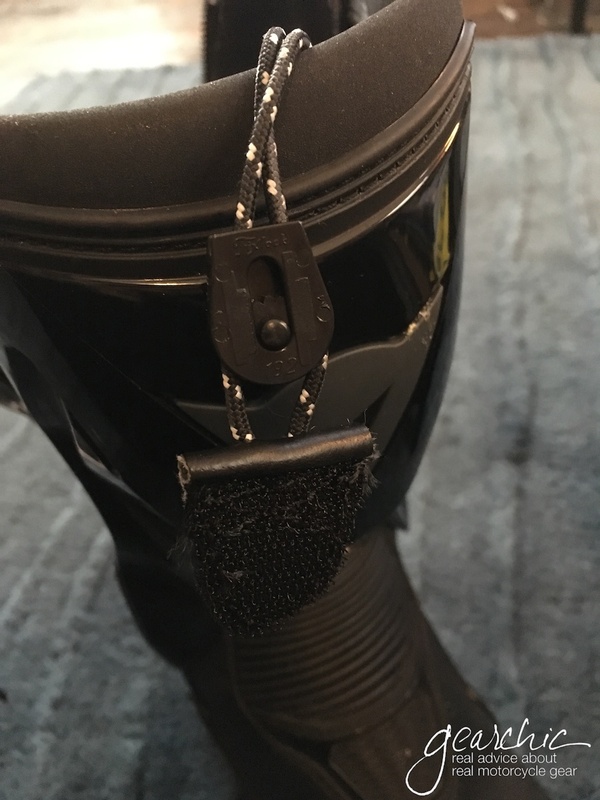 My only real gripe is the way the cinch inside locks down on the inside of the boot. It's difficult to reach down in the front of the boot to lock it down. Don't get me wrong, I think they're a really nice feature to have especially if they feel a bit loose around the ankles. But when you slide the cinch down and then try to lock it in place, it's hard to push down the slide when your hand is in the boot. It's a minor complaint, nothing major. I've also done some long day rides and overnights in these and I find them to be perfectly comfortable to wear for long periods of time. I wouldn't call them hiking boots but for a track specific boot, they are comfortable enough where I don't feel the need to change into casual shoes if it's a couple hours off the bike. They're certainly far less bulky than other brands I've tried. It's what I love about them the most. . If you're looking for a sport tourer that will last you 20,000 miles a year these may wear out a bit faster than you want them to. But I think for most of us who ride an average of 5-10,000 miles a year these should last more than a few seasons. 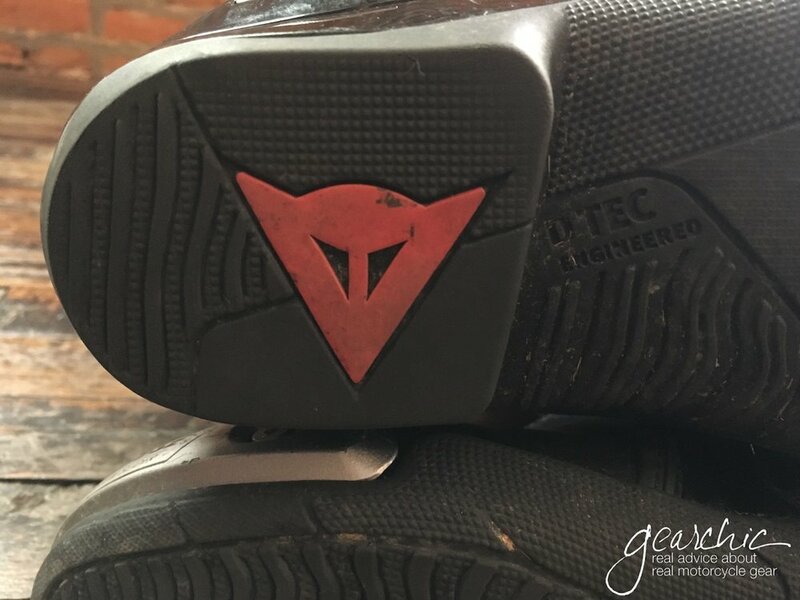 If you're not ready to jump straight into the deep end with the Torques, then consider the Nexus boots, which offer firm support (not fully attached lateral support) at a lower price point. They're also a bit wider across the arch and above the instep compared to the Torques.